Broken bones are common injuries in many accidents, including car accidents or slip and falls. To some people, broken bones might seem “minor.” However, breaks can leave people laid up in bed for months and, if the break is particularly bad, might require expensive surgery. The key to healing broken bones is to make sure they heal in their original position. Failure to set the bone properly can cause disfigurement and disability, not to mention pain. 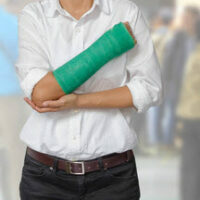 To set the bone, your doctor might use a cast or a splint, which you will wear for a few months. Other breaks will require surgery. Surgery might be necessary if the bone shatters into many pieces or if it happens in complicated areas like the wrists or ankles. To set the bone, your doctor might install a screw, pin, or steel plate which will hold the bone in place. To have surgery, you will typically need general anesthesia so that you are not awake. You might also suffer an allergic reaction to whatever material was used to make the pin, screw, or plate. If your allergic reaction is severe, you might need to undergo a second surgery to replace the hardware with something made from alternate materials. Surgery under general anesthesia can be very difficult for some people, especially the elderly or those with other existing health complications. Talk to your doctor before agreeing to go under the knife. Patients who only need a cast or splint can expect to pay several thousand dollars, which can cover doctor’s fees and the cost of setting the bone. Because pain is a common side effect, you will also need prescription or over-the-counter painkillers. Where the break affects your leg or ankle, you might also need crutches or a wheelchair. All told, you could spend $4,000 or more treating a break. If you need bone surgery, however, you can expect to pay much more. Treating a broken arm might cost more than $15,000, including X-rays and surgeon’s fees. Replacing hardware can double the costs as well. These out-of-pocket medical bills do not include any lost wages as you recover, which might also cost you several thousand dollars as well. All told, your “minor” break could cost $25,000 or more—money which you do not have and should not be expected to pay. If someone else is to blame for your broken bones, you are entitled to financial compensation. At Bundza & Rodriguez, we have helped victims injured in car or truck accidents, motorcycle accidents, and slip and fall cases. On our clients’ behalf, we have obtained compensation for medical care, lost wages, property damage, and pain and suffering, among other losses. To schedule your no-obligation consultation, please call 386-252-5170 or submit our contact form. Initial consultations are free.